Carroll County has a population of 167,134 residents and is part of the Baltimore Metro area and the Baltimore – Washington Metro area. The County was created in 1873 and named after Charles Carroll, one of the signers of the Declaration of Independence. This rural area has experienced significant growth over the last decade as new developments create a suburban landscape. Carroll County occupies an area of 452.40 square miles and is bordered to the north by the Mason-Dixon Line. Agriculture is the primary economic driver in the county and contains two unincorporated cities; Westminster and Taneytown. The county is also home to six unincorporated towns; Manchester, New Windsor, Union Bridge, Hempstead, Mount. 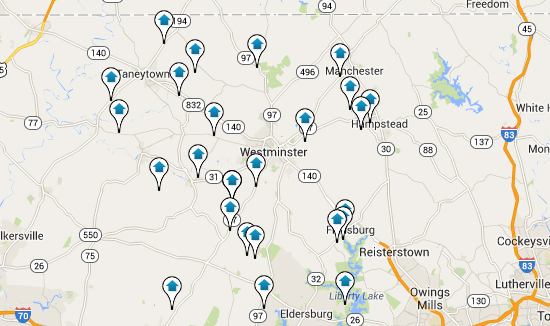 Airy, and Sykesville. Over the last decade homeowners in the area have experienced dramatic upheavals in the market. Residents of Carroll County are recovering from the aftermath of the great recession. There has been some turnaround in the market over the last three years and prospective homebuyers are showing interest again. The median home values rose 5.1% over the last 12 months and is anticipated to stabilize throughout the next year. Median price per square foot in the county is now hundred and $170, $10 higher than the Baltimore Metro area. Although forecasts are predicting that the market will level off, there is no guarantee that outside influences won’t cause the home values to rise even higher. For example, foreclosures are usually a factor that impacts home values; Carroll counties foreclosure rates are lower than the national average and lower than the Baltimore Metro area.